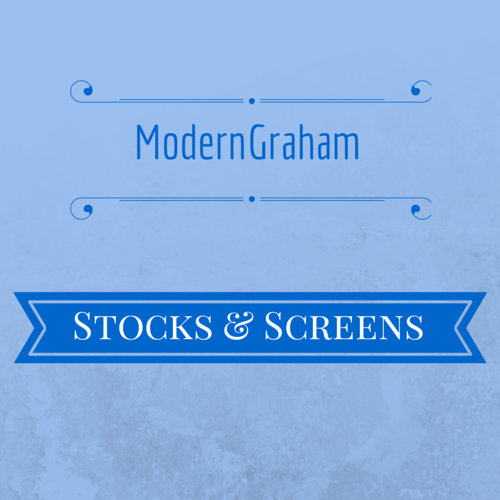 October 2015 MG Stocks & Screens Now Available! Inside this monthly PDF report and spreadsheet is a listing of all the companies reviewed by ModernGraham (currently 561 different companies) in a handy table with some key figures, including dividend yield information. It then proceeds to screen the companies regarding different topics. This is a great tool for your research into value investing opportunities. You can also download the raw data in a spreadsheet including each company’s rating regarding Defensive Investors, Enterprising Investors, or Speculative, the MG Value, the price as a percent of the MG Value, the PEmg ratio, the dividend yield, the beta, the current ratio, the Net Current Asset Value, the market-implied growth rate, consecutive years of dividend growth (not yet available for all companies covered), Graham Number (not yet available for all companies covered) and a link to the latest ModernGraham valuation! With a premium membership, you can access every ModernGraham valuation of over 550 companies. The ModernGraham approach is three-fold, and the new design will highlight that fact. This will enable you to conduct your research as efficiently as possible. Stage 1 looks to determine if the company is suitable for either the Defensive Investor or the Enterprising Investor; Stage 2 presents ModernGraham’s calculation of intrinsic value and gives some brief comments; and, Stage 3 provides some data to assist with your further research. I do not like auto-renew. Unfortunately, I do not have a way to accept checks at this time. You can pay for a single month if you do not like the auto renew subscription. We will look into the possibility of offering a full year one-time payment.